Join us for 4-5 hours aboard the our boat cruising the majestic Blue Pacific Ocean. Only minutes from your Waikiki Hotel in Kewalo Basin. Start your adventure at around 6am and join us in search of pelagic fish ranging from 5lbs to over 500lbs! Reel in mahi mahi, ono, tuna and possibly even the Powerful Pacific Blue Marlin! Our 38' Hatteras is equipped with Penn International 130 and 80 class rods and reels. Powered by twin Cummins Motors, this vessel is known for it's bite! Waikiki Sport Fishing is proud to offer daily half day and full day Honolulu Waikiki fishing charters to some of the best blue water fishing grounds in Hawaii. Captain Chris and Captain Nick have been fishing literally since before they could walk or talk. The amount of time that these two brothers have spent out at sea is an extraordinary asset available to them in anything they do on the ocean. The brothers originally moved to Hawaii in 2000, where they located themselves in Kaneohe. This is where they purchased their first Hawaiian boat and started Kaneohe fishing charters out of He'eia Kea Boat Harbor. They have been fishing together for over 10 years. They are familiar with the ledges and secret spots to catch big fish. 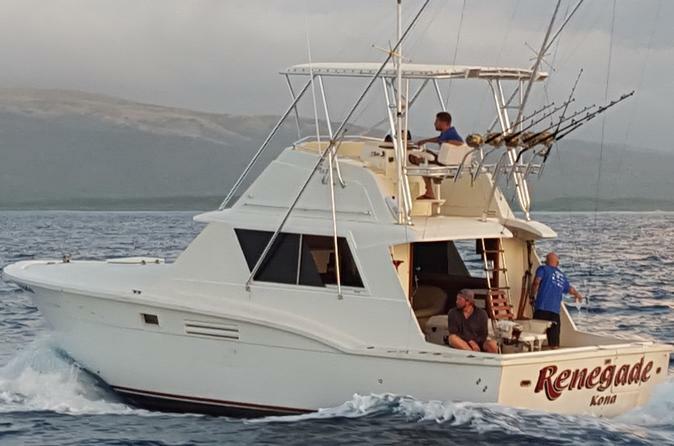 Jump aboard our Hawaiian Custom Built 39' Force Fishing Machine the Snoopy V, (Waikiki) can take up to 10 people fishing. Additional Passengers over 6 require an additional fee. The Renegade our 38' Honolulu fishing charter boat for private groups up to 6 anglers. Both boats are USCG certified. Let our experienced crew make your Hawaii fishing adventure a truly memorable one. From private Kaneohe fishing charters to larger groups, we handle all the details. Just sit back, relax and wait for the strike.